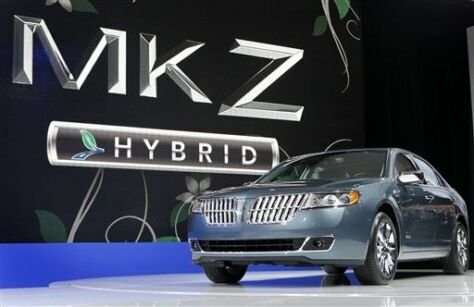 FILE - In this photo made March 31, 2010, released by Microsoft Corp., a new Lincoln MKZ Hybrid is unveiled at the New York International Auto Show in New York. Ford Motor Co. will soon have a first in the U.S. auto market: a hybrid sedan that costs the same as the gas-powered version. (AP Photo/Microsoft Corp., David Goldman) NO SALES.